Once again we need your help at this year’s League of NH Craftsmen Fair. We will begin set-up Friday the 3rd, around 8:30. We are usually done by noon. We will be in the same tent this year. It is always amazing to me, to see an empty space turned into one of the Guilds signature events. Not only is it an important contribution to our treasury, but most important we promote the Guild by demonstrating our woodworking skills with fairgoers. And of course those same fairgoers will have a chance to win one of the many items you have made and generously donated for our raffle. For those who will be volunteering for the first time you are in for a remarkable experience. First of all you will be spending time at beautiful Mount Sunapee Resort. You will have a chance to visit the many booths where League members will be displaying their work. Many Guild members are juried and along with their booths they will have items in Living with Craft. A must see. For those of you who have done this before you know how much fun we have working in the tent. We get to watch woodworking skills we might not yet be familiar with. We may see a better way to sharpen our tools. And what fun to watch as people stroll by and look at our tent. They keep looking and the next thing they are sitting at a table filling out raffle tickets or watching as a dovetail is cut or a Celtic Knot carved. 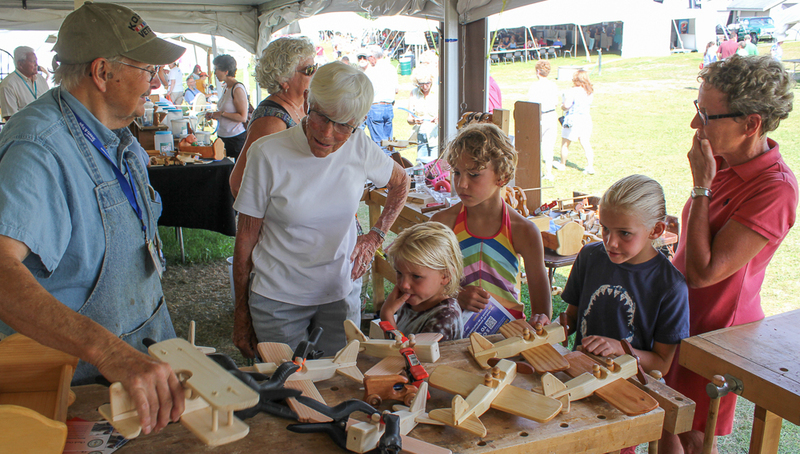 How to volunteer for the Guild booth at Sunapee.